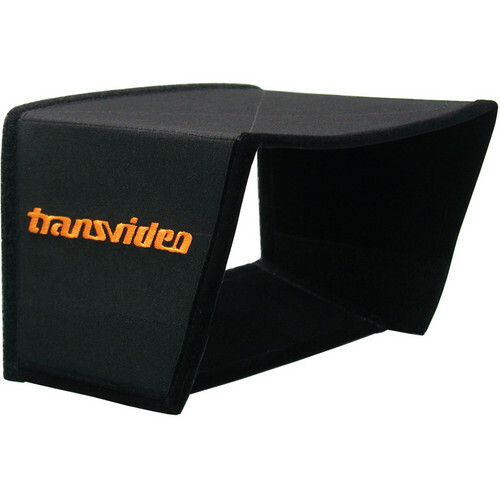 The Transvideo Deluxe Hood for 6" HD Center with Bottom Flap is used with the Transvideo 6" HD monitor to reduce glare and provide a more accurate representation of color in various lighting conditions. Covered with black velveteen on the insides, the hood absorbs light emitted from the monitor and prevents it from being reflected on the screen. Designed with a slanted cut, the hood allows you to view the full screen even when the monitor is tilted. The hood can also be used in bright sunlight or low-light conditions. The detachable flap can be removed from the Deluxe Hood to allow the monitor to be installed flat on a surface. During shipment, the bottom flap can also be used to protect the monitor screen from damage. Box Dimensions (LxWxH) 8.0 x 7.0 x 0.3"